We all remember when Whistler Blackcomb announced that they would exchange the 25 year old Village gondolas with new and bigger ones in the fall of 2014. The old cabins found new owners all over the world. But do you know the history of all the lifts at Whistler Blackcomb? Slide on and take a gondola ride through the ages. 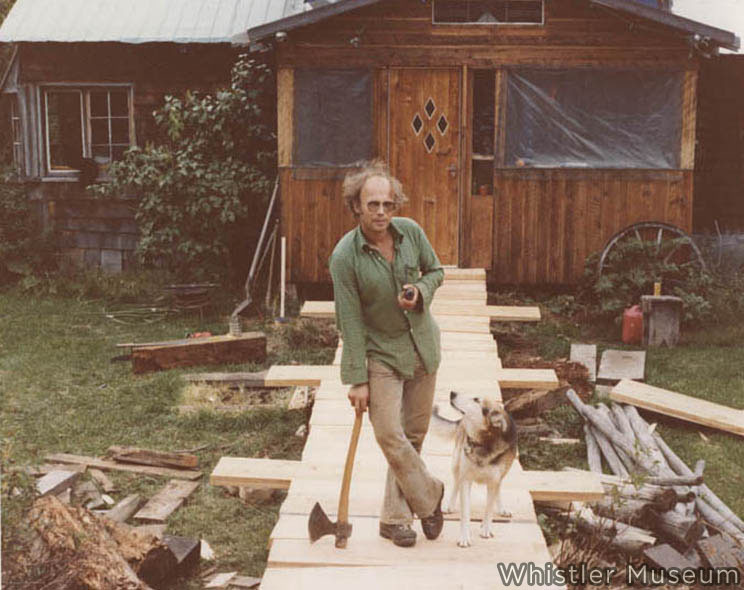 The original Red Chair brought skiers up to the Roundhouse from 1965 to 1992, Whistler Museum, Whistler Mountain collection, 1970s. The first lifts were built on the south side of Whistler Mountain (what is now known as Creekside). By fall 1965, several lifts were installed, including a four person gondola, a double chair lift, and two T-bars. 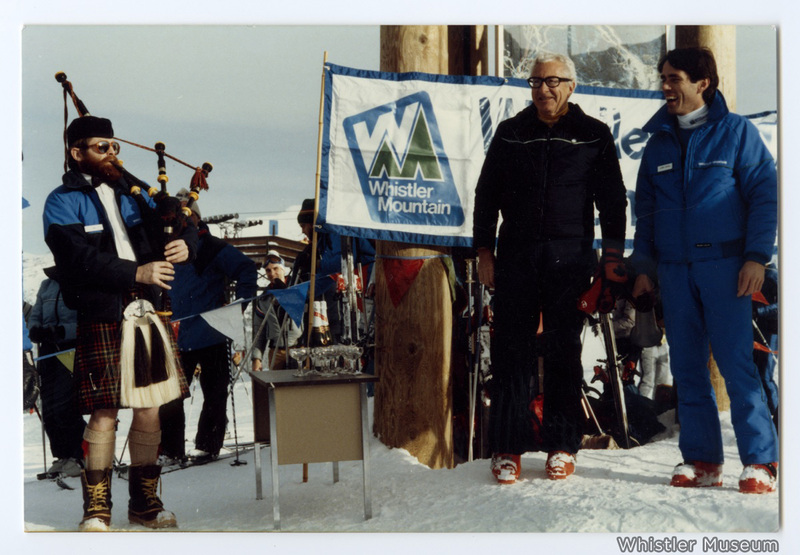 With the opening of Blackcomb in 1980, a long-lasting rivalry started between both independently owned mountains. This led to a race to build lifts with the motto “higher, faster, and safer” in mind. Whistler was large, highly departmentalized, more Canadian and European as well as more traditional. New to the business of skiing, the Vancouver based Hastings West Group took over Garibaldi Lifts Limited. In contrast, Blackcomb was young, tight, US-dominated and half controlled by the Aspen Corporation, whom were already experienced in the ski business. Blackcomb ski runs were designed to follow the fall line whereas Whistlers runs were designed more so to side-run the mountain. 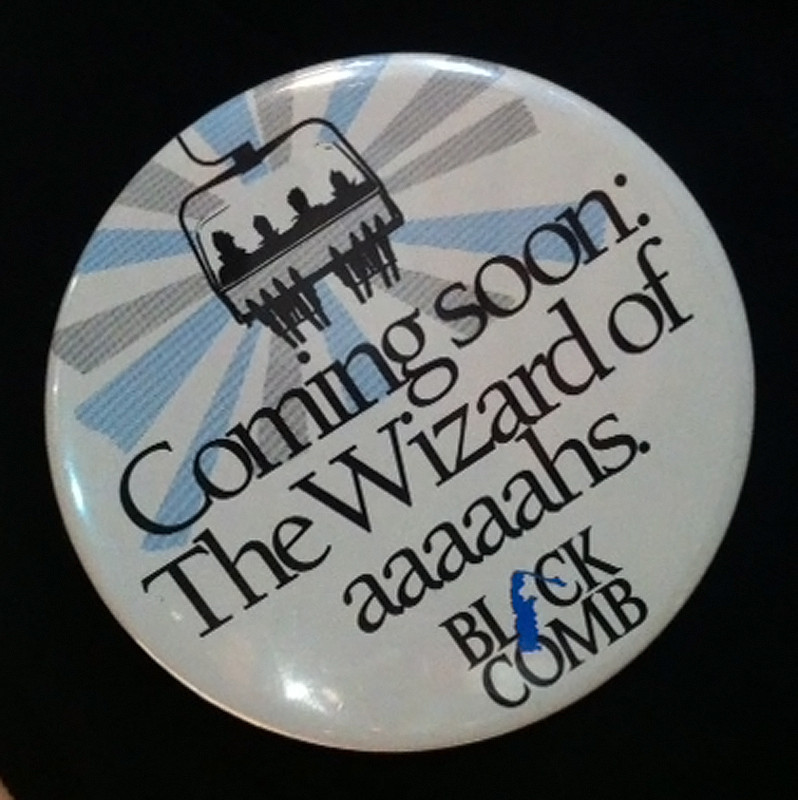 Original pin that was used to promote the new Wizard Chair at Blackcomb Mountain in 1987, Whistler Museum. In the following years, a marketing battle between both mountains was up and running. When Blackcomb installed its alpine 7th Heaven T-Bar in 1985 it became North Americas only “Mile High Mountain”. The new area opened up, including four powder bowls, wide open glacier skiing, and it also provided visitors with a vertical mile (1,609 meters’/5,280 feet) of skiing. A year later, Whistler Mountain responded with a high alpine triple Chair lift called Peak Chair, opening Whistler’s highest peak (1,530 meters’ (5,020 feet). The new alpine area provided experts with some of the most challenging runs in the world. 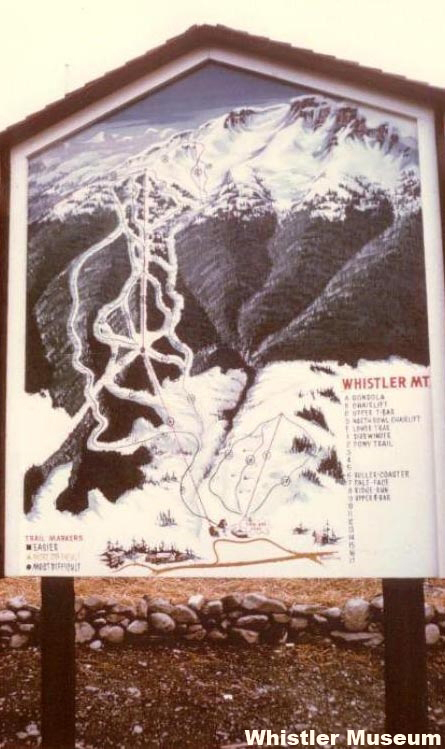 In 1996, Whistler became the only resort in history to be simultaneously named No. 1 by Snow Country, SKI and Skiing magazines. However, even more exciting was the news announced March 1997 when Whistler and Blackcomb Mountain merged to form one big mountain company, which is today well known as Whistler-Blackcomb all over the world. With the Peak2Peak opening in 2008, Whistler-Blackcomb finally broke two world records and is recognized in the Guinness World Record Book 2015 as the highest cable car above ground (436 meters above the valley floor) and the longest unsupported span between two cable car towers (3.024 kilometers). For skiers and boarders it is now easier to access the high alpine terrain on both mountains. But even for sightseers it is redefining the mountain experience in winter and summer by very impressive views and an incredible experience. Those 50 years of lift history show: Competition drives innovation; but when two former rivals team up, they can move mountains and bring great peaks closer together. 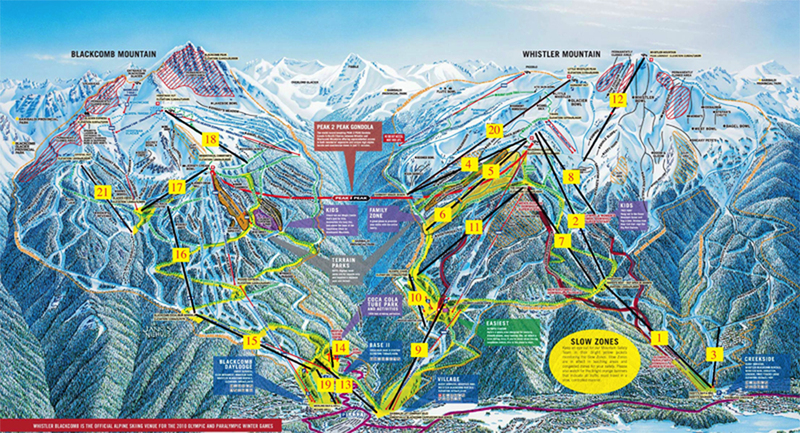 Explore Whistler’s lift history on the map. 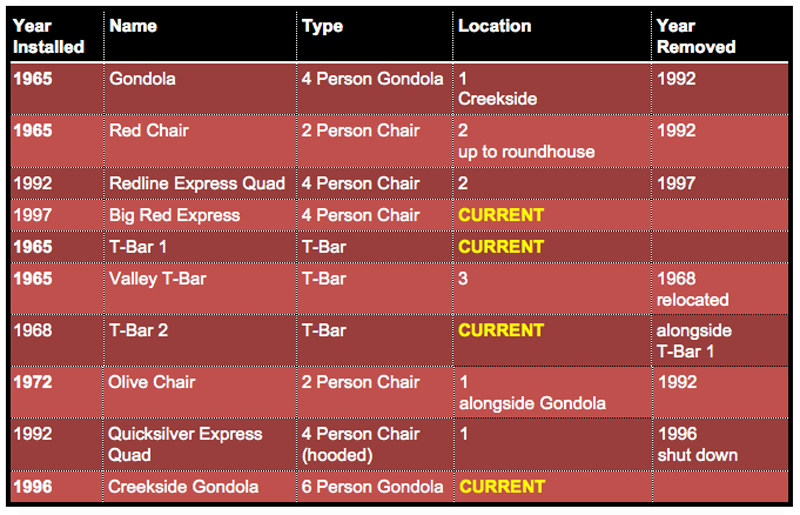 For a description of the location numbers in the map see the tables below. 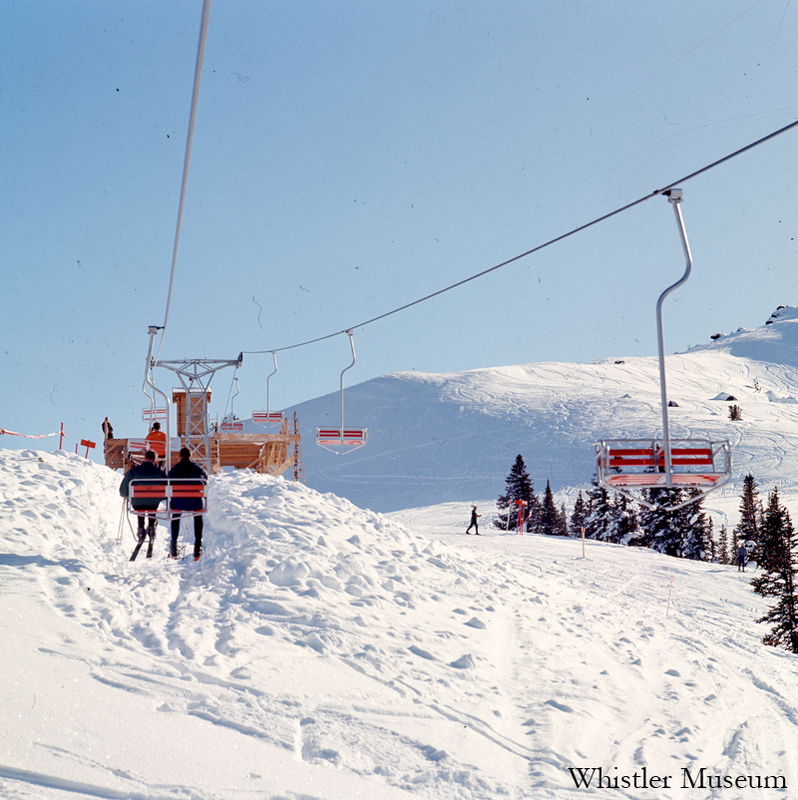 In January 1966, Whistler officially opened to the public with its first lifts, a four-person gondola manufactured by the Swiss company, Mueller Lifts Ltd., to the mid point of the mountain, a double chair lift called Red Chair to the upper tree line, which were both active until 1992, and two T-bars, T-Bar I on the top part and a Valley T-Bar. In 1968, the Valley T- Bar was relocated, and a new T-Bar 2, which still runs alongside T-Bar 1, was installed. Four years later, the two-person Olive chairlift was created alongside the Creekside Gondola, which was replaced in 1992 by the Quicksilver Express Quad Chair. The lift was shut down in 1995 and replaced by the 6-person Creekside Gondola that has been running since. The Redline Express Quad became the new version for the Red Chair and Little Red Chair and was itself replaced by the current Big Red Express in 1997. A Blue double Chair lift from today’s bottom of Harmony to the top of Emerald started running in 1966 until its removal in 1995. In 1968, a new double Green Chair 1 was installed and lengthened two years later. Alongside of it a new one, called Green Chair 2 came to live in 1975. Both Green Chairs were replaced by only one quad Chair lift in 1989, which was itself replaced by today’s quad Emerald Express in 1997. In 1972, a new double Chair lift, Orange Chair, ran from the top of the Creekside Gondola up to the Roundhouse until 2009. In 1978, the Red Chair got a little brother called Little Red Chair on its right side that was a bit shorter. It was removed in 1992, but Franz’s triple chair came up in the same place six years later in 1998. When Blackcomb Mountain opened in winter 1980, Whistler Mountain directly responded by building the Village Chair as well as developing a whole new network of runs on its northern flank. A 10 Person Village Gondola renewed the Village Chair in 1988. All towers and the complete structure remained in the same location until today, only the cars were replaced in 2014 by new 8 passenger cabins. In 1980, Whistler Mountain also built the Olympic Chair and the Black Chair to develop the new network of runs on its northern flank. The Olympic Chair was shortened nine years later where it remains since then. Removed in 1999, the Black Chair covered the area from the top of Olympic Chair up to Roundhouse for 19 years. One year after Blackcomb had installed its Alpine 7th Heaven T-Bar to become North Americas only “Mile High Mountain”, Whistler Mountain responded with a high alpine triple Chair lift, called Peak Chair. In 1998, one year after the merge of Whistler and Blackcomb, a new quad Peak Express that is still in use today replaced the 12 years old 3-person Peak Chair. Blackcomb Mountain opened in winter 1980 with 5 chairs, including Fitzsimmons, a triple chair that ran from the Village to Base 2, replaced by today’s Excalibur Gondola in 1994. Skidder was located were the current Tube Park area is. Cruiser, a triple Chair, covered the second section of today’s Excalibur Gondola. Cat Skinner still runs today. Choker was replaced in 1994 by the quad Excelerator Express that is still in use today. Only two winters after opening the mountain, Blackcomb established Jersey Cream a 2 person chair in 1982. I was replaced by the current quad version in 1989. When Blackcomb installed its alpine 7th Heaven T-Bar in 1985 it opened up a new area offering immense above tree line skiing including four powder bowls and wide open glacier skiing. To keep up with Whistlers Peak Chair, Blackcomb removed the old 7th Heaven T-Bar and has build a new 7th Heaven Express, a 4 person Chair, running along a complete new and longer lift line, that is still in use today. In 1987, a skiers learning area for beginners on Blackcomb was accessible by the Magic Chair, which has been replaced by the current triple Chair version in 1994. With the new Harmony Express quad Chair Whistler Mountain has been offering a new terrain spanning from the edge of the Symphony Amphitheatre all the way over to Glacier Bowl and down to the Peak Express since 1995. This area now known as the Harmony Zone provides a wide variety of beginner to expert terrain. In 2014, a high-speed six person chair lift replaced the quad chair to dramatically improve the uphill capacity by 50 percent. The old quad chairs were re-used to build the Crystal Ridge Express. Since 1987, skiing on the Horstman glacier, named after Henry Horstman who arrived in the valley in the year 1913, is possible with the same-named T-Bar that is still operating. Additionally, faster mountain access directly from the Blackcomb Base combined with new runs has been provided by the currently running high-speed quad chairs Wizard Express and Solar Coaster Express Chair lifts. Only two years later Blackcomb expanded further by implementing the new triple Crystal Chair lift and the Showcase T-Bar. Both T-Bars, Horstman and Showcase, doubled the summer glacier skiing capacity. Blackcomb came up with the current version of the Glacier quad chair in 1992. In 2013, the quad chairs of the former Harmony Express were re-used to build the Crystal Ridge Express which replaced the old Crystal Chair. The new chair follows a longer lift line which increased the capacity to the Crystal Zone. Shortly after modernizing the Whistler Peak access, two new quad Chair lifts, the Fitzsimmons Express and the Garbanzo Express, were installed to allow easier access from the Village up to the mid-station respective the Chic Pea Hut. In 2005, a new high-speed quad chairlift, today’s Symphony Express, was added on the Whistler side. It has provided a whole new beginner and intermediate terrain around Symphony Bowl and a closer access to the top of Flute Bowl. The new world class Peak2Peak Gondola opened in 2008. It provides visitors with double mountain access on a peak level. The gondola has the worldwide longest unsupported span (3.024 kilometers). With its 436 meters above the valley floor it is the highest lift of its kind. Many thanks go to Rod Nadeau and Ecosign Mountain Resort Planners Ltd. who helped gather information about Whistler’s lift history. We received a great response for our recent post about Whistler-Blackcomb ski run names, so we figured we would post a few more. Last time we were pretty Blackcomb-heavy, so this week we’ll weight things more towards Whistler. Franz’s Run – Franz Wilhelmsen, from Norway, was one of the founders of Garbaldi Lifts Ltd and remained the president of the company for 20 years. Bagel Bowl – Preferred piste of former Whistler Mountain President, Lorne Borgal, affectionately known as the ‘Lone Bagel’. Franz Wilhelmsen and Lorne Borgal (the Lone Bagel!) at the Franz’s Run dedication ceremony in 1983. Chunky’s Choice – Named after Chunky Woodward, he was another one of the founding directors of Garibaldi Lifts Ltd. It was his favourite run. Jolly Green Giant – Named after Vancouver and Whistler resident Casey Niewerth. He was over six feet tall and dressed all in green so he was easily recognized on the hill as “the Jolly Green Giant” named after the canned vegetables brand. 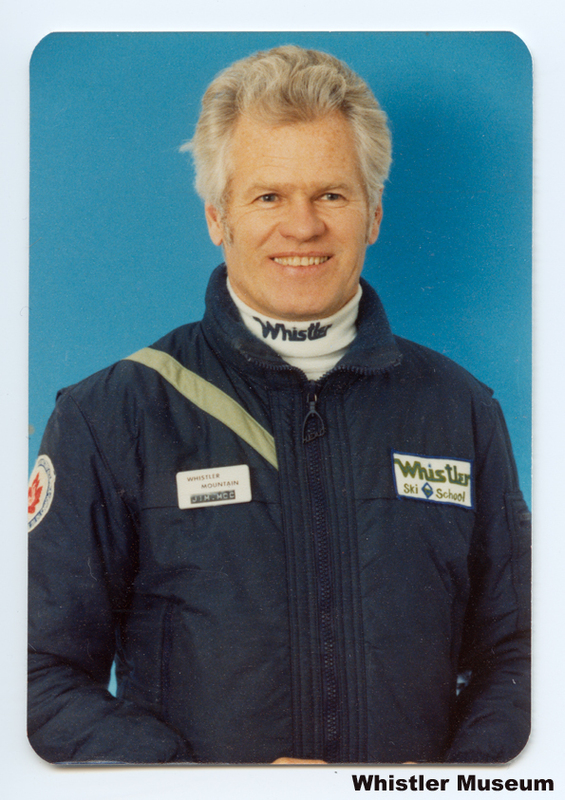 Jam Tart – Named after cat driver John Cleland who was tragically killed in Whistler Bowl while recovering avalanche duds – Jam Tart was Cleland’s nickname. Pony Trail – At one point during the construction of lifts on Whistler Mountain, fire hazard forced workers to use packhorses to transport supplies up the mountain. The road they used became a ski run, so it kept the name. Tokum – Named after Tokum Corners – a ‘skibum’ house lived in by John Hetherington, George Benjamin and others. Tokum was the run they took home at the end of the day. We’ll let you figure out how Tokum Corners got its name. George “Benji” Benjamin outside Tokum Corners, 1970s. Cockalorum – Named for mechanic Jack Goodale, who died in an accident in 1981. Cockalorum means a small person with a large presence. Boomer Bowl – Apparently, windows in Alpine Meadows rattle when this bowl gets bombed for avalanche control. Burnt Stew Trail – In the summer of 1958 Florence Peterson, Kelly Fairhurst and Don Gow were on a back-packing trip around Whistler Mountain. After setting up camp one evening they started cooking dinner in an old billy can over a fire, built into the rocks of a dry creek bed. Nobody remembered to stir the pot, resulting in the smell after which the area (Burnt Stew Basin), and ski run are named after. 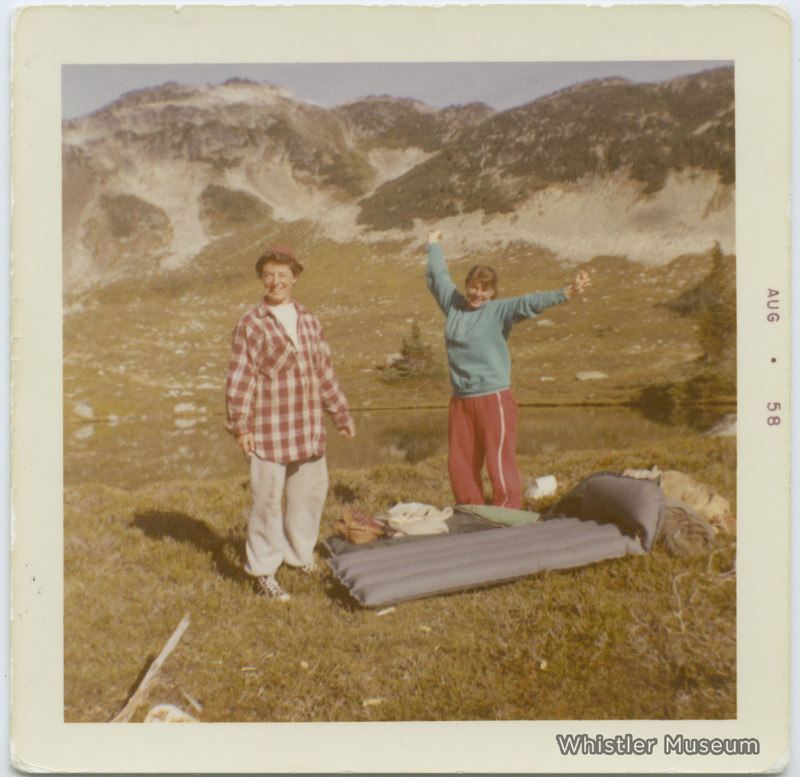 Kelly Fairhurst and Florence Petersen during their 1958 Burnt Stew hike. Arthur’s Choice – Named for Mountain Planning and Environmental Resource Manager Arthur DeJong in 1994. Designed to bring a new dimension to glad skiing. Xhiggy’s Meadow – Named after Peter Xhignesse, an original ski patroller on Blackcomb Mountain who died of cancer at 32. There are literally hundreds of more run names, both on and off the trail map, so if you are curious about any specific names leave a comment or e-mail us your questions!